I live in Victoria, so rugby fans can sometimes feel few and far between. I was describing the beauty of watching rugby; Quade Cooper’s long flat bullet passes to the backs outside, Adam Coleman making dominant tackles, putting more and more pressure on the opposition, Michael Hooper (despite being one of the smaller loose forwards going around) running into bigger men while still pumping those legs and gaining metres. I still think that of all of these images, watching Israel Folau evading defenders at full speed, changing direction effortlessly, is like poetry in motion. His tweets, on the other hand… For someone who plays ‘the game they play in heaven’ he seems to be rather focused on hell. The whole situation reminded me of this story in the book of Luke in the bible. Jesus tells the story of the Pharisee (the ultra-religious elitist) and the tax collector (still part of one of the most hated professions in society – don’t worry ATO, my tax debt might have been late but I promised I’ve paid it). This is how the story Jesus tells goes. I find it is all too common in our human nature to point out where everyone else is going wrong rather realising the “log in our own eye”. While I don’t know Izzy well enough to comment on the depth and robustness of his faith, I often find there are many whose ‘Christian beliefs’ look more like what some have termed “moralistic therapeutic deism”. This is the belief in a God who is like a divine butler; there to make you feel good if you do all the ‘right things’. It is a works-based view that unfortunately leads the moralists to blame the issues of this world on the others who aren’t doing the ‘right things’. It often leads to pride and then a separation of oneself from those of ‘lesser morals’. It all seems rather contrary to the Jesus we see in the New Testament hanging out with the marginalised of his culture; the lepers, the tax collectors, and the prostitutes. U2’s Bono once said, “if Jesus was on earth today, you’d probably find him hanging in a gay bar”. Too often in our political and religious climate, we use language that seeks to separate ourselves and blame the other for the world’s woes. While I believe we should be able to be critical of each others actions, public social media accounts do nothing to further the discussion and heal conflict within relationships. It’s also disappointing that Folau’s comments come at a time in the Christian calender where Christians get together to celebrate the greatest love story ever told. It is the story of a God who came to earth and allowed himself to be humiliated and tortured as a sacrifice for the indiscretions of this world – and it is said that this was done because of his love for all. Not just the ‘upright citizens’ of this world. When preaching to the non-rugby public I often add that there is no sport, that I know of, that combines the different talents of so many different body types. Gridiron comes close, but I still think it’s outdone by rugby. I’d say rugby would have to be the foremost sport when it comes to inclusivity, so I understand the response by Rugby Australia to Folau’s comments. One of their main roles as an organisation is to sell our sport to the public. 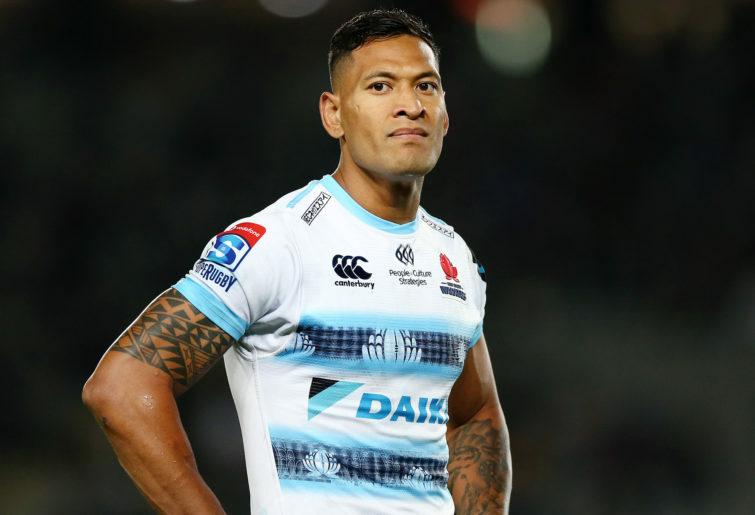 Visually, Folau does a great job of selling our sport, but socially? Not really. While I believe in the importance of freedom of speech in our country, it is a freedom that is not without consequence. Jokes aside, I hope Izzy realises his comments come across like the self-righteous Pharisee in Jesus’ parable. I hope and pray his time away from the game is spent reflecting on his faith. The letter to Galatia that Folau quoted was written by the Apostle Paul to the church in Galatia. This was a church that Paul had started and knew the congregants well, hence the rebuking when he hears that the church is ‘falling apart’. What I’m getting at here is that if my friend, for instance, has a drinking issue I would discuss with him or her my concern because I care for my friend. I would not, however, post on their social media page “YOU’RE A DRUNK! AND YOU NEED JESUS”. I do hope we see Izzy back playing rugby but maybe fasting from rugby (and social media) for Lent might be beneficial to reflect on the way in which his comments are received, the hurt that results, and to think about his public apology.